"The trip was fantastic. 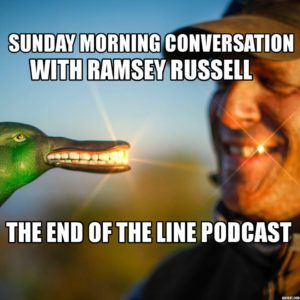 I would, and will, recommend it to family, friends and anyone else who’..."
In this edition of The End of The Line Podcast, Ramsey and I get together for part seven of the “Life’s Short, Get Ducks” series. We talk about Ramsey’s perspective the day Pat Pitt had his heart attack. Ramsey tells a couple of stories of his and Pat’s hunting travels. Then, we talk a little about the science of shooting waterfowl. Great episode with some great, great stories! 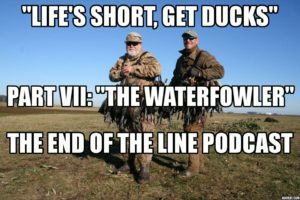 In this edition of The End Of The Line podcast, Ramsey and I get back together to talk USHuntList.com, how to pick your next waterfowl guide, and the basics of how guides become part of GetDucks proven organization. 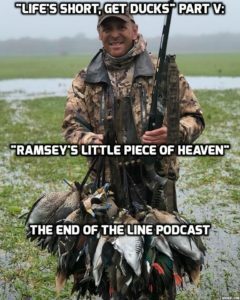 In this edition of The End Of The Line Podcast, Ramsey and I attempt to get back into the “Life’s Short, GetDucks” story, but we talk about his son Duncan Russell coming down to Argentina, his investigative trip to Northern Argentina, and mishap stories with flights that he and clients have had while traveling abroad to duck hunt. 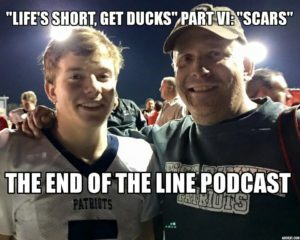 In this edition of The End Of The Line podcast, Jake Latendresse and Rocky Leflore get together with Ramsey Russell to resume “Life’s Short, GetDucks.” What happened after getting out of the hospital? What other obstacles would change him after the accident? Moving past the scars and using them as building blocks for success in the future. 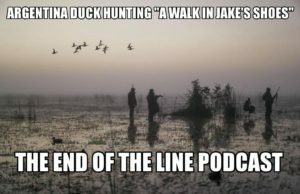 In this edition of The End Of The Line Podcast, Jake Latendresse, Josh Webb, and Rocky Leflore get together to discuss Jake’s week Argentina duck hunting. From the flight in all the way the hugs goodbye, this podcast episode has everything you need to know about duck hunting in Argentina as a first-timer. 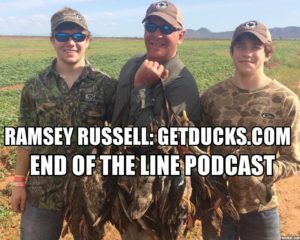 This week on the show we check in with Ramsey Russell, Ryan Bassham, and the rest of the boys as they pursue ducks down under! 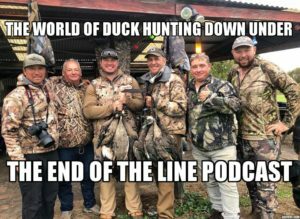 In this edition of The End Of The Line Podcast, Josh and I are have a roundtable discussion with the crew that is in Australia with GetDucks.com. 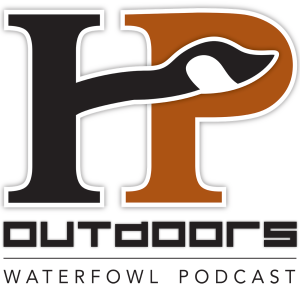 We visit with Ramsey Russell of GetDucks, Ryan Bassham of Sitka Gear, Jake Latendresse of Latendresse Media Collective and our co-host on this show, Glenn Falla of Falla’s Waterfowl Outfitters, Paul Sharp of Cooking Game AU, Trent Leen of Geelong Field and Game Australia, and Darren Linton, editor of Field & Game Magazine. Hear about Australia duck hunting while this collection of hunters are in the field, wrapping up another great duck hunt down under. 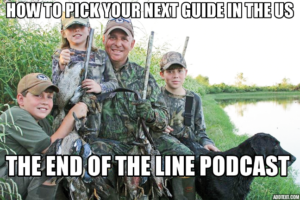 In this special edition of the End Of The Line Podcast, we get to see behind the curtain of what it is like to be in camp with some of the leaders of the duck hunting world. 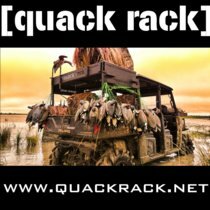 Ramsey Russell of GetDucks.com, Mike Morgan of Mojo, Garrett Walker of Quack Rack, Blair Findley from Australia, and Mike Plein of Toxic Calls are all in camp in Idaho this week. 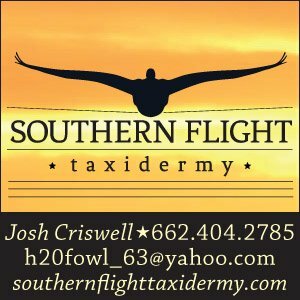 We have a fire-pit type discussion about the spinning wing shoveler decoy joke that Ramsey played on Mr. Terry Denman (which has become the world-famous Spoonzilla decoy) that has turned into a business opportunity, shovelers, coots, and waterfowl hunting Idaho. Really Cool podcast and we hope you enjoy. 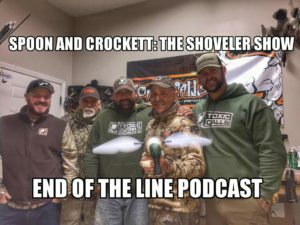 In this edition of the End Of The Line podcast, Rocky is joined by Ramsey Russell, of Getducks.com. 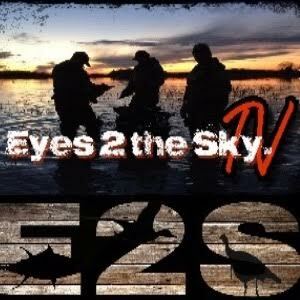 If you are ready for more information about duck hunting than you have ever heard, listen to this podcast. We start off talking about the pintails. Then, we talk about shooting ducks after running a herd of kangaroo out of a flooded timber spot in Australia. Then, we recap the poor teal season. Then we talk about the duck hunting in the Mississippi Valley and how it is changing in the short term and long term. 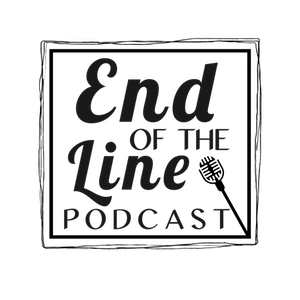 In this episode of The End Of The Line Podcast, Ramsey and I get together for part five of his story. We talk about the number of people that have reached out to he and I about the last two parts of his story. 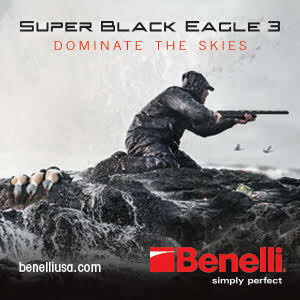 We also visit about duck hunting in Argentina. Finally, we talk about choosing the right guide. It is a great break from the story we have been telling the last couple of weeks.